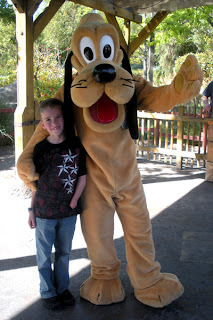 I have always thought that standing in line at Disneyland to get pictures with the characters is crazy. In fact, I always laughed at all the people wasting their time waiting for characters when they could have been riding on rides instead. Robby was never very interested in characters and so Kirk and I thought it was something we would never do. Zoe, however, has changed everything. The last two trips we have made to Disneyland, the characters have been her absolute favorite thing. 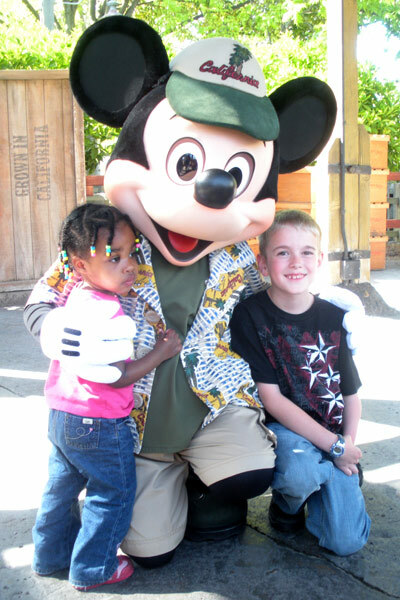 She can spy them from clear across the park and starts screaming "Hi Mickey" or "Hi Goofy" at the top of her lungs. She is patient while we wait in line to see them. 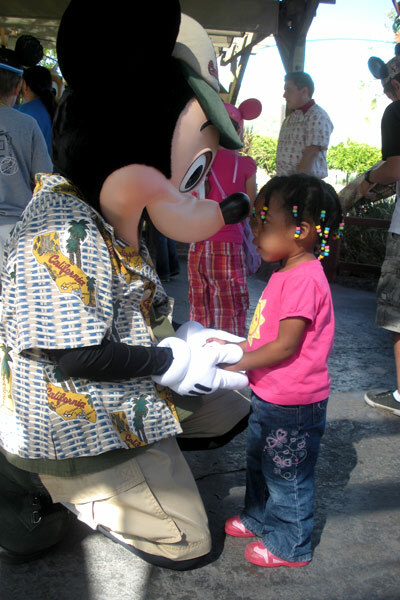 When it is her turn she walks right up to them and gives them a hug. Then, when it is time to leave, she tells them goodbye, and cries. Amazingly enough, seeing the characters has now become one of my favorite things to do at Disneyland. Seeing my baby girl so happy makes it all worth while. 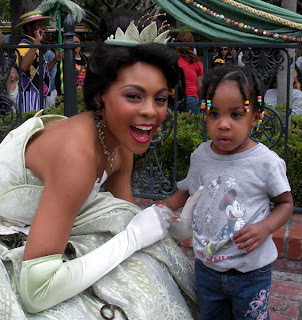 This trip, we were especially excited to see Princess Tiana. We watch "Princess and the Frog" at least once a day. 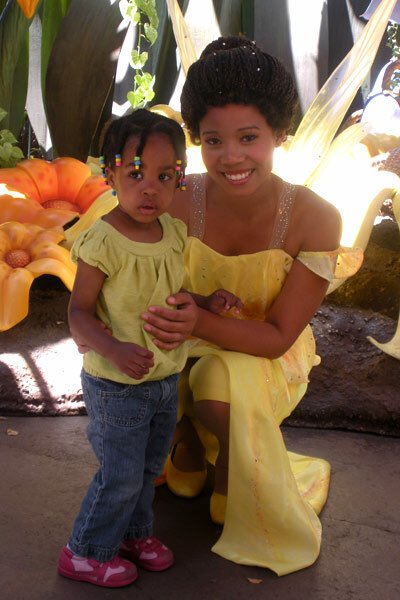 In fact, right now, if you ask Zoe what her name is, she will most likely tell you "Tiana." She loves her. 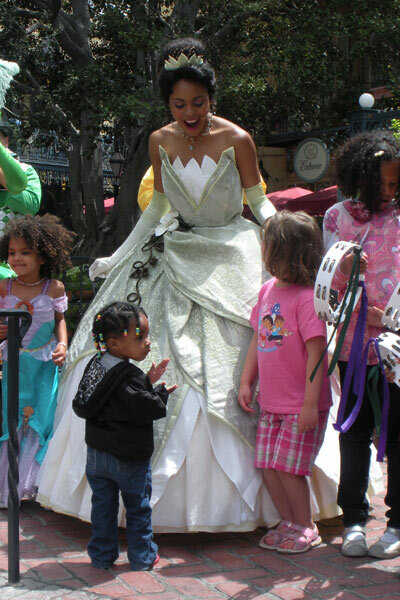 Princess Tiana is a little difficult to see. She is only available a few times a day. The first time we went to see her, we found out that she wouldn't be taking pictures and talking to the kids, but instead was doing a show. Zoe loved the show. She was singing all the songs with her. At the end of the show, they invited all the kids to come up and dance with them. Zoe went right up to the stage. She didn't even hesitate. One of the dancers held her hand. Zoe loved it. Before long though, she got bored with the dancer and decided she wanted Princess Tiana instead. 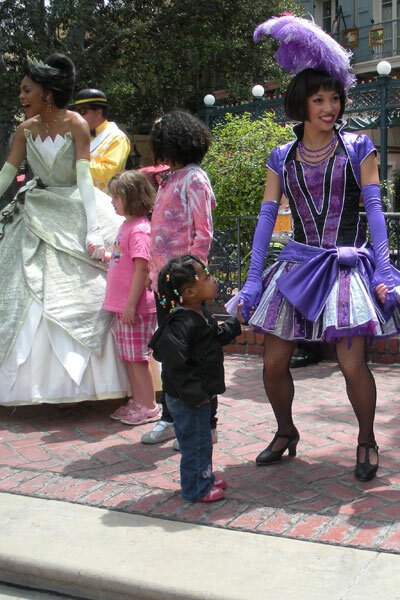 So, she just walked over and stood right in front of Princess Tiana, staring at her. 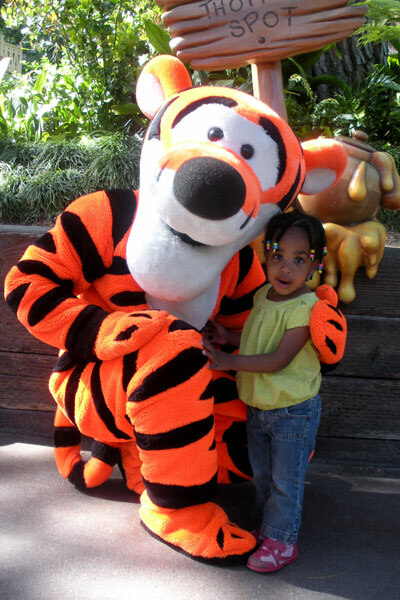 Tiana was so cute with her. She kept smiling at her and grabbing her hands and dancing with her. Zoe loved it. A couple of hours later we went back and Zoe was able to talk to and get a picture with Princess Tiana. She was so excited. She doesn't exactly look happy in this picture, in fact, she doesn't look happy in any of the character pictures I have. She loved seeing the characters, but she was not at all happy that she had to turn around and let me take her picture. We saw many other characters on the trip. Some fairy whose name I don't know. Zoe thought she was a princess. Zoe liked her because she had beads in her hair. They had a great time looking at each other's beads. One of the characters Zoe was most excited to see was Tinkerbell. 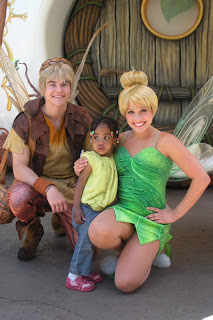 I didn't even know she knew who Tinkerbell was, but she got so excited anytime she saw anything Tinkerbell at Disneyland. Kirk and I finally decided that we would wait in line to let her see her. We sent Robby and Emily to ride a few rides, and we waited in line. It was one of the longest lines we waited in while at Disneyland, but it was worth it. Zoe was so excited. Pooh is always a favorite. 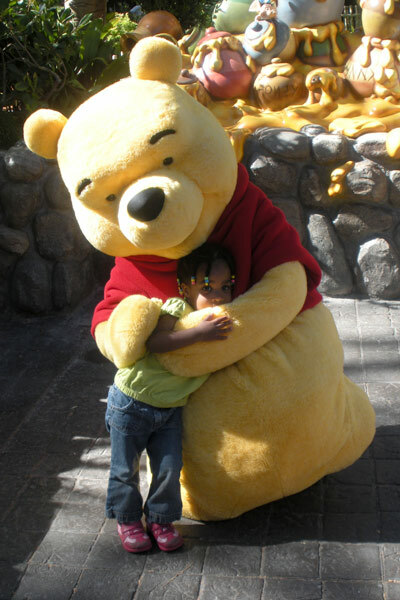 I think she would have stood right there, snuggled in Pooh's arms, forever. 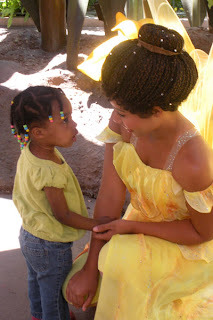 Zoe tells everyone she sees that she went to Disneyland and that she said "Hi to Tiana and Tinkerbell." Evertime I am at my computer she asks to see the pictures. I have such cute kids. I agree with you. I used to think that waiting in line for the characters was a huge waste of time when you could be enjoying the rides instead. It's amazing how having children turns you into everything you swore you'd never be. I love your pictures, and that's what makes the standing in line worth it. 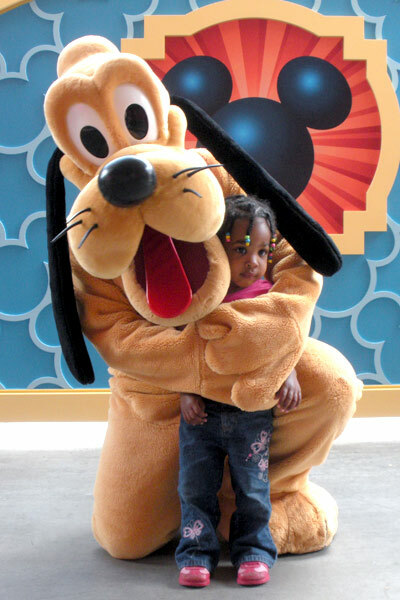 I felt the same way, but my daughter LOVES the characters. 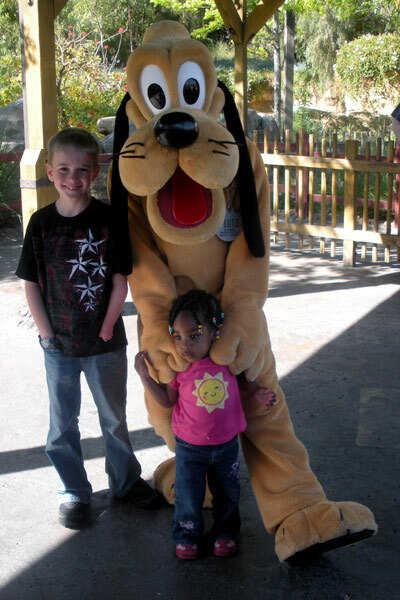 It seems like most of the time when we go, we are usually just visiting the characters all day long. 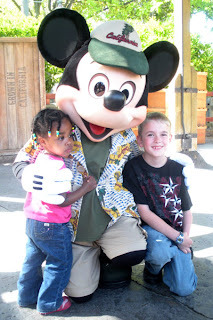 What ever makes the kiddos happy! You got some fabulous shots!